I woke up feeling quite tired today, dreading to meet up with Robbie and Amrick because I was so sleepy. For the past 3 days I was only having about 1-3 hours of sleep each night. I was still having a difficult time falling asleep and it could be the fact that when I crawled into bed late at night i wasn’t getting into my pajammies. I was just wearing my outdoor attire in bed, even when my pants were covered with a ring of dirt around the hem of my pants. However, I knew that these guys, Robbie and Amrick, were going out of their way to want to hang out with me, so I got ready for my adventure. it was very scenic. I just saw rows and rows of pasture and one of my favorite moments was looking at the hills marked with a burst of yellow; the hills were filled with yellow petals and it looked really bright against the grey sky. The clouds were heavy and low, which made the sky appear ominous. 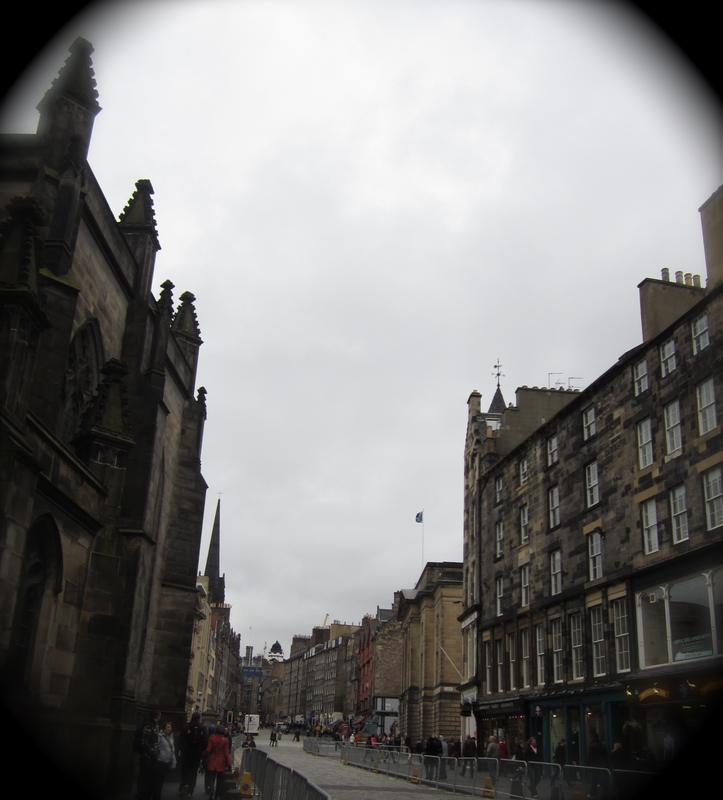 I followed a flight of stairs that was wrapped around this cylindrical building and once the stairs ended I plopped myself on the cobbled steps of the Royal Mile and was completely overwhelmed by the large buildings stacked back to back of each other. It was absolutely majestic to see the Edinburgh Castle at the top end of the street. All of the limestone structures looked as though they were were 7 or 8 stories high. Every building was detailed and incrusted with crown moldings. 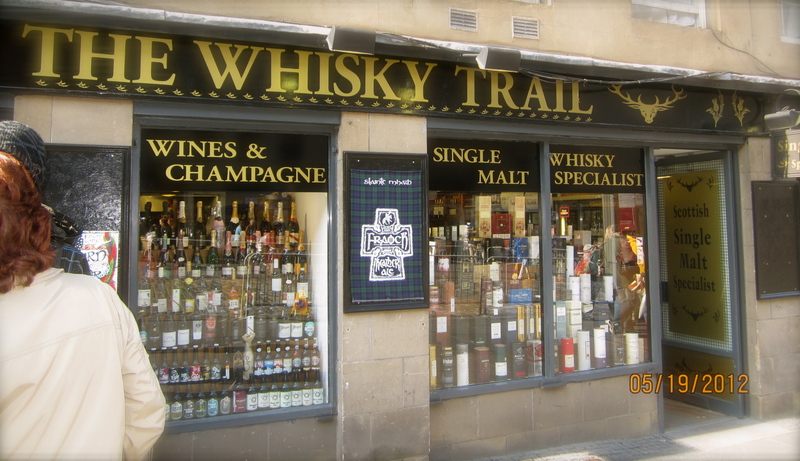 I also saw several whisky shops that I wanted to step inside, but I didn’t want to tempt myself to go inside because I knew I was on a budget. 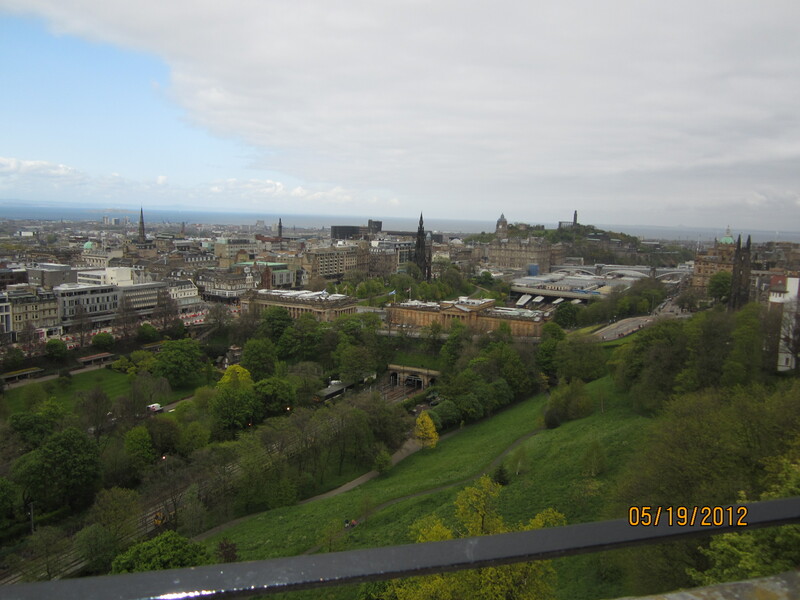 At any rate, Edinburgh was like a traveler’s paradise; you don’t have to think about searching for all of the famous land plots, since it’s all there laid out for you to see!!! It really felt like traveling back in time to the 1600’s. 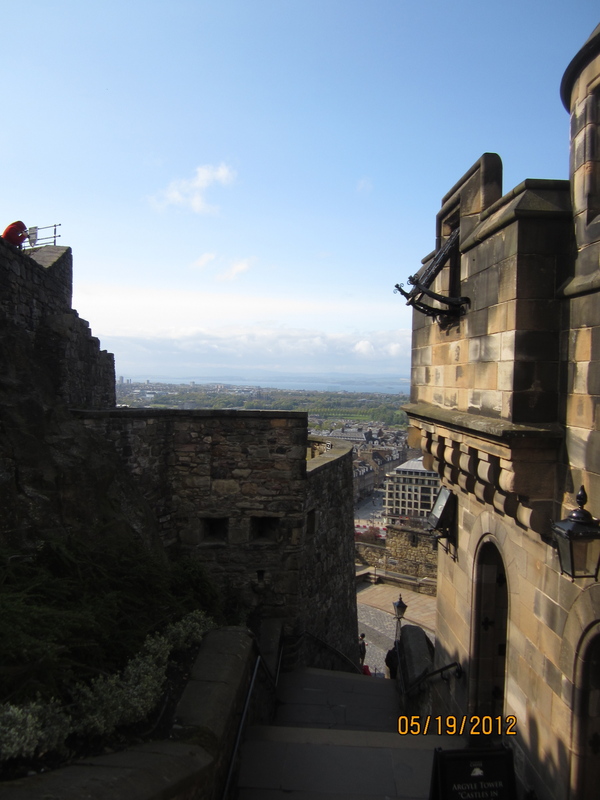 I started to imagine living back in time and was reminded of studying a semester of Shakespeare–the art and the deep link between England and Scotland. I learned that during the 1600’s, there was a huge outpour of people getting sick because the drainage system was bad. During that time, after people took a dunkin’ doodle (there’s no other way for me to put it! 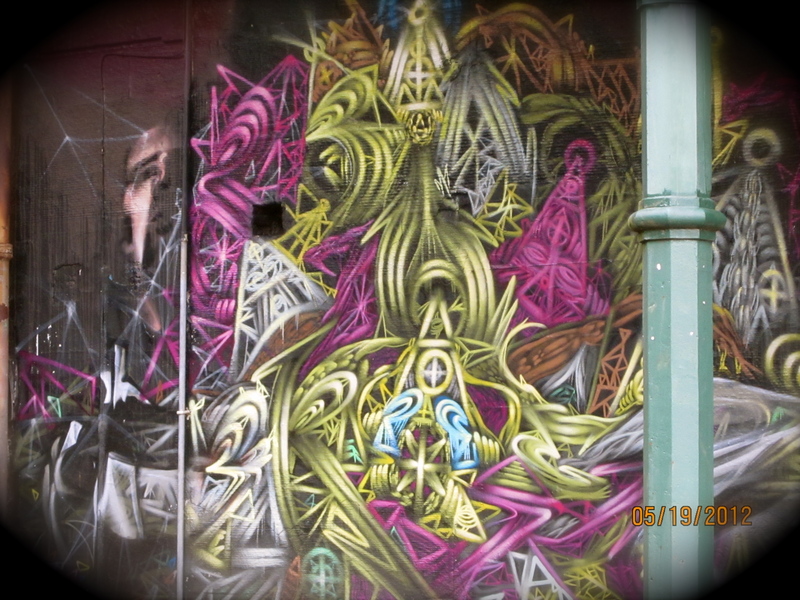 ), they dumped it out on the streets. The whole city is built on an incline and all the poo just collected at the base of the city, creating a huge bacteria outpour that caused people to get sick and die. I first went to the cathedral. The favorite part of the cathedral was going inside the boys’ choir room. I think someone in there said that there were little decorations near the ceiling of the young choir boys who died. The room was a small size, isolated from the rest of the cathedral. 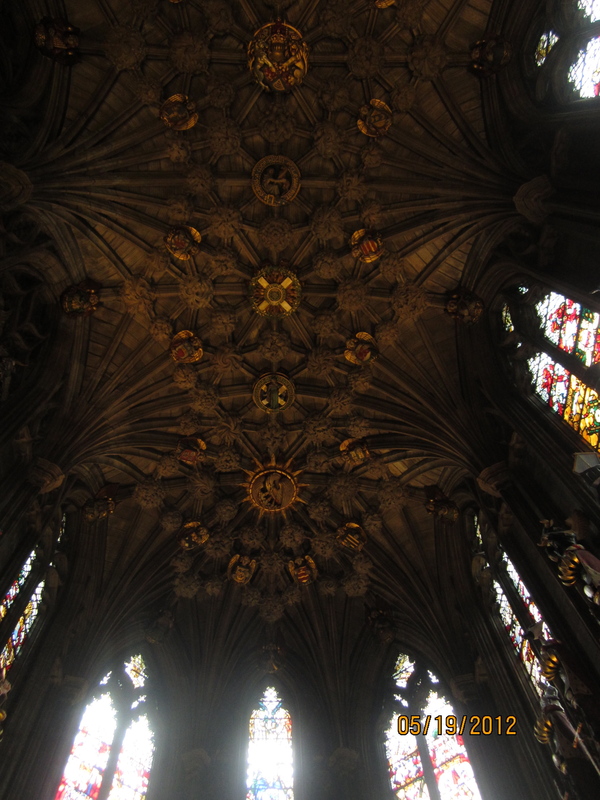 This is the ceiling from the choir room from this picture above. The picture on the left is little decorations for the choir rooms and the picture below is the ceiling of the choir room. 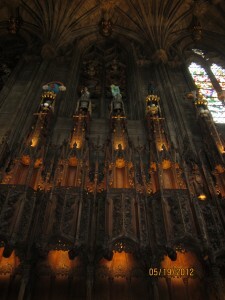 The cathedral was majestic, in which it had all kinds of statues and, of course, pretty stain glass windows!!! After I went to the cathedral, I continued walking uphill. I noticed that there were live musicians playing on their bagpipes! There were so many places that I wanted to see. For example, they were offering spooky night tours. I could only imagine how this place would be like lit at night! 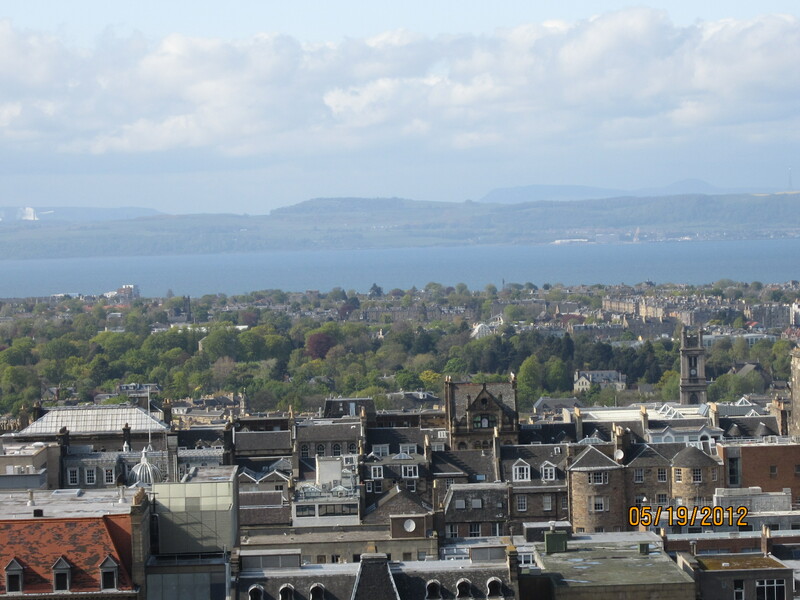 Aw…that’s when I started to wish that I could stay in Edinburgh at night to get a whole glimpse of everything, day and night! I also knew that I wanted to go to the Whisky Scotch Experience. My friend told me that it was a little cheesy ride that’s kind of like Disneyland’s Mister Told Stool’s Ride, where you sit in a wheel barrel and it takes you from one room to the next. HEHEHE! That sort of thing is totally up my alley. 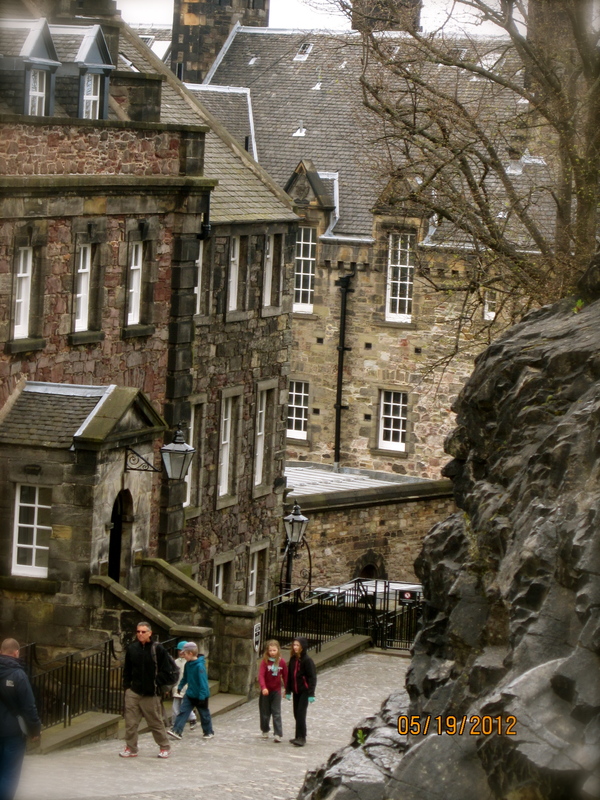 At first, I was very distracted by the castle, but then looked up to the left and noticed that I was standing right in front of the window that said, “The Whisky and Scotch Experience!” Cool deal! I saw my destination!!!! I walked inside and stood inline for my tour. 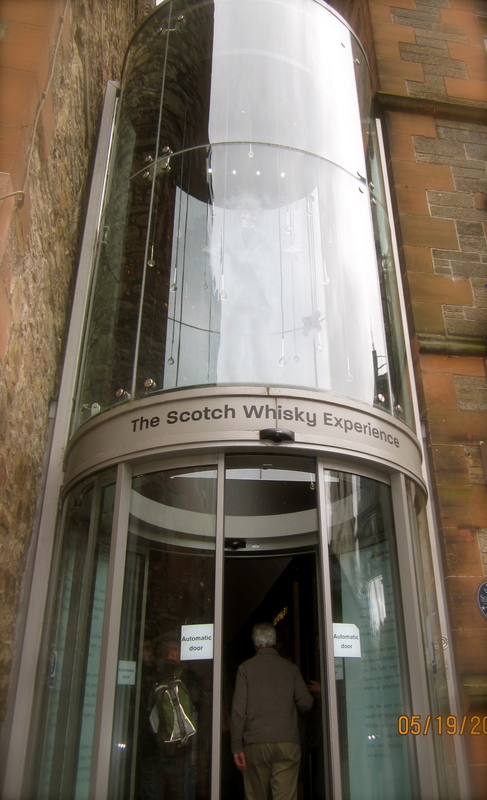 I paid for the basic tour that included one whisky and a tulip glass. The tour was £17. WHen I rode in the wheel barrel, there was a hologram of a man who looked like Mark Twain that gave me a virtual tour of the distillation process. I recorded the whole tour on my father’s camera! HEHE! At the end of the ride, I met the main tour guide and there were about 15 people in my group. The tour guide led us to a tasting room, and she gave us an in-depth discussion about tasting whisky and providing the regions of whisky in Scotland, which were Speyside, Islay, Lowland and Highland. It’s interesting that she said that because I’ve heard and read from several sources that the regions of whisky in Scotland range from anywhere between 4-6. She handed us a “scratch and sniff” card that had four of these regions. She stated that Speyside usually smells like ripe bananas, Christmas cakes, and tropical fruit. 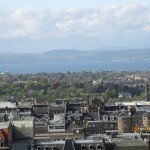 As far as Lowland, she indicated that the whisky in this region has citrus, grassy notes and Highland has vanilla notes, and there are more floral notes in the inland part of Highland. One can also pick up characteristics of corcus alber from the American oak. And the easiest one to detect is, of course, Islay, which has smoky qualities. Then, she took us to a room that had, I think, 3,548 bottles of whiskies! Originally, the collection was owned by this Brazilian businessman, and it took him about 35 years to collect them. None of these bottles are opened! I was thinking that it was a load of tom foolery on that man’s part. If I owned each bottle, I would’ve cracked all of them open! There is nothing like sharing whisky with other people. 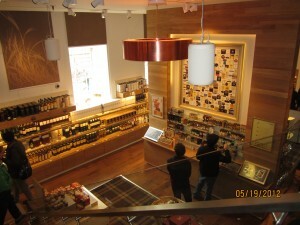 She then led us to a room that was a store/bar, in which there was a Johnnie Walker bottle that costed £100,000. The bottle was over the top. I think she said that the bottle was cut by 5 different crystal-cutting specialists and there was a diamond on the bottle. However, she emphasized that at the end of the day, it was only whisky; thus, price shouldn’t matter. One of her favorite whiskies is in a soda bottle from Mexico. I agree. 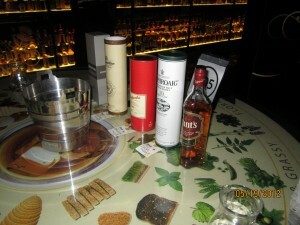 That’s what whisky should be all about–fun! 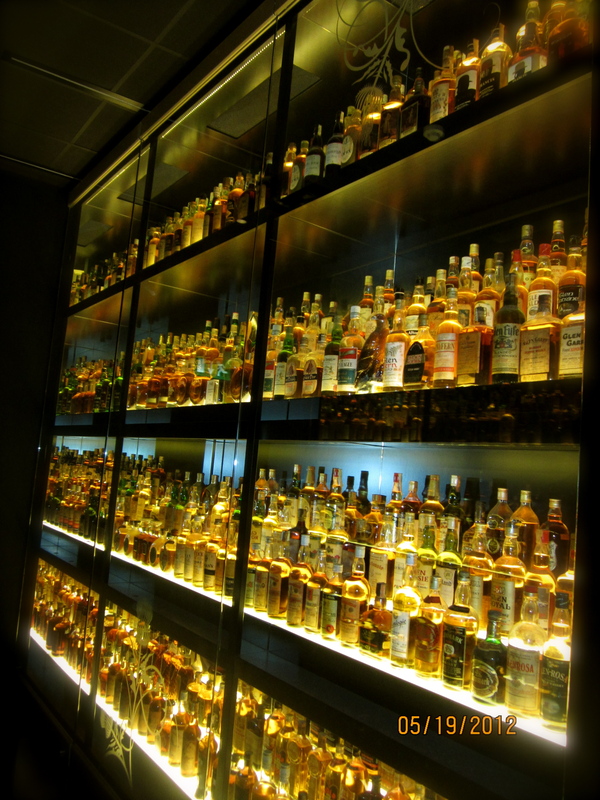 🙂 By the way, I hope that one day, I’ll get the opportunity to own a huge collection of whisky ! The tour was uber fun. They have a great bar down stairs. One day, I’ll have to go back and sit down to sip some whiskies there. I just knew that I was on a tight budget, so I couldn’t really be loose with money and sip a bunch of expensive whiskies. After the Whisky Scotch Experience, I went straight to the Edinburgh Castle. 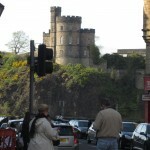 It costed about £24 to get into the castle. 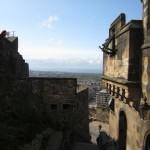 The castle was incredible and it looked as though it was built into the mountains. 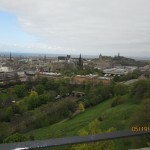 Paying to get in this place was well worth it because the view overlooking the whole city was spectacular. You can see the ocean as well. 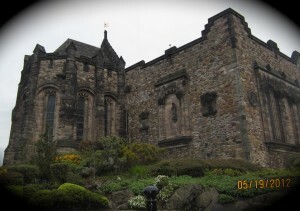 There were parts of the castle that had small, sitting areas, perhaps about a quarter of a typical size bedroom, where one can peer through unclear glass to stare at the city. The castle’s plot appeared to have a little city within itself, in the sense that there were different buildings in the main center. 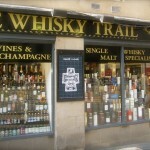 There was also a whisky shop! How neat, though I was pretty sure that was later added for the tourists. After the tour I was hungry and went to a cafe. I ordered a panini and it was about £9 pounds. My day was getting so expensive!!! After I ate, I paid for my meal and left the shop. The girl who was working there found me outside and handed me the tulip glass I left behind. How sweet of her to go out of her way to do that for me!!! 🙂 By 6:30 PM, I decided to leave Edinburg because I was still thinking that the sun would set at 8:30 PM in Scotland. I figured that I’d give myself a 1 hour leeway for getting lost as well. gh I had been in Scotland for a full week. There were so many fun stories about my adventures. However, my decisions about what I would like to do with my life didn’t click into full view because I didn’t see a distillery yet. The week before my trip, my heart was set on pursuing a whisky career, and I was ready to rock it out in this industry. Then, I was wondering if I made a good decision by leaving my job and pursuing a whisky job. Sometimes, I would feel as though I was too socially awkward or too shy to be engaging and charming like the brand ambassadors that I met this past year. 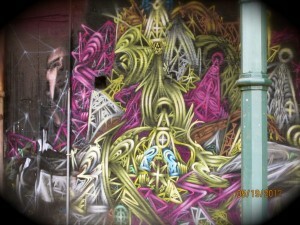 I also wondered if I “opened up too much” with strangers, telling them that I would feel inspired by them because I would see them as positive outliers in my life, especially since I spent the first 4 years of my life sharing a room with my parents and siblings in a 1-bedroom apartment where all of us slept on the floor. I would keep on thinking that I was a lower class citizen and below everyone that I would start to get intimidated by people. For example, I recently had the opportunity to attend 2 tasting adventures at someone’s home in West Los Angeles, and the event was filled with all Jewish, married men. It was inspiring to hear them talk about their dedication to their family, where they had to put their dreams of visiting distilleries on hold because they wanted to save money for their children’s college, etc. However, they were still able to pay for their hobby and collect bottles. During the last tasting event, for example, there were 16 different Brenriach expressions and some of these bottles didn’t exist in the USA. They even had one of the managers for the SF Distillery Company come to the event at their home. I was thinking that they chose a great high-paying career that allowed them to fund for their expensive hobbies. Then, I started to wonder if I needed to go back to school and get a master’s in speech pathology, so I could obtain a fairly stable, good-paying job. I wondered if I’d ever be as good as them. I wondered if I was too sensitive and thin-skinned to be in this field. At any rate, I have many days to figure out what my purpose in life is from this trip!!! Around midnight, I was in the living room again, emailing people. 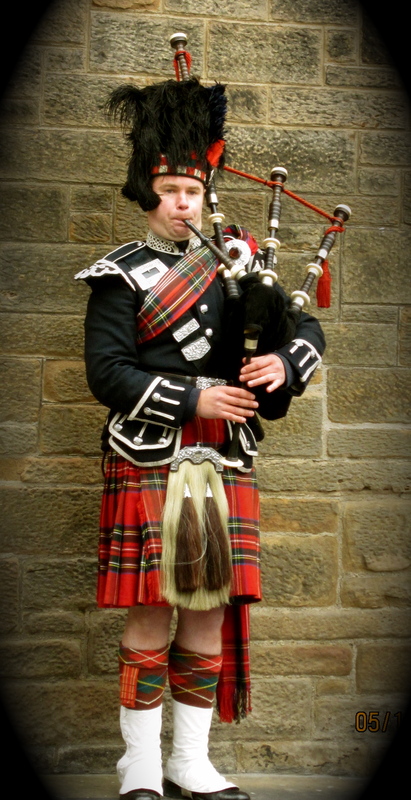 I then met Paul, a man from Oban, who originally lived in Edinburgh. He came back from a historical soccer match. I didn’t remember the names of these 2 teams, but he told me the last time they played together during the finals was in 1906! It was a great night for him because his team won. I told him that I saw a huge band of fans with painted faces who chanted out loud when I was leaving Edinburgh. We chatted until 4 in the morning. 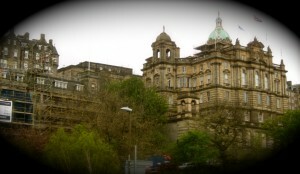 He decided to check into the hostel that night because his bus ride back to Oban would’ve taken too long. He couldn’t sleep in his room because people were snoring. So, he opted to stay in the living room for the remaining of the night. 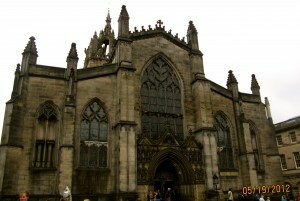 Paul told me that his great ancestors have names engraved in the cathedral at the Royal Mile. In addition, one of his distant uncles has a street named after him. Again, I couldn’t believe that I was continuously getting so much help from the locals here. I felt absolutely lucky that everyone I met was nice and sweet.